Today, there are much people discovering that they can Make Money Online. In fact, it opened the way for more job opportunities for those that can't get a good Real Job. Although, there can be many scams spread on the web, there still are legitimate ways to earn money online. 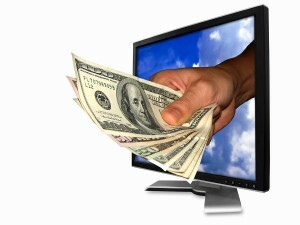 Here are five ways to earn your living online. Affiliate Marketing is one of the oldest, yet it is the best way to make money online. The whole idea is about advertising for products of certain marketers to gain a commission for each sale you make for them, without having to create your own product. Affiliate Experts can earn thousands every year, so it's definitely a serious matter. However, there are other professional marketing jobs but unfortunately it takes a lot of hard work and dedication to be a successful Affiliate Marketer. Are you a skilled writer? Do not underestimate blogs by thinking that they are just Virtual Magazines, there are many people making their living from blogging by working seriously to be professionals. These people in usual blog the most about technology, travel, dating, finance and other popular topics. The most common way to make money with a free blog is to sign up with Blogger and put Google Adsense ads on your pages. Each time a visitor clicks on an ad, you get a part of what was made for that click. Of course, there are other ways to earn money from blogs, as well. Actually, there are many people selling items on eBay everyday. Most people tend to sell their used items on the eBay Market with low prices. It obvious that the main point is to trying to buy lower and sell higher. There are several books written on the subject, so new eBay Users should not have a hard time finding sources for tips and tricks. Everybody has a talent, you can use that talent to make money on the Internet. Writing, designing, website development, consulting and account management are all examples of skills that you can use to Make Money Online. Luckily, there are several sites that connect Freelancers with clients. This last section contains other not-so-well-known ways to make money online, such as gambling, surveys, and sites like Cha-Cha that you pay for a special service. Cha-Cha hires people who text answer questions. Depending on how much money you need, Cha-Cha may not apply to you. Also, Gambling is a great way to earn money, if you are lucky and skilled. There are legitimate Poker Sites that allow players to gamble with real money. Surveys are a known way to make money, but not an effective way. In average, survey takers make only a few cents or dollars. The highest paying surveys I've personally seen only offered three dollars. These surveys were long and boring, but some people enjoy this kind of work.